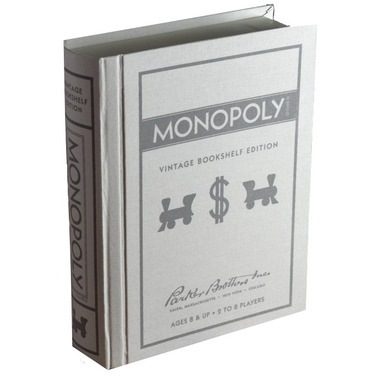 This Monopoly linen vintage bookshelf edition is the perfect combination of form, function and fun! the stylish linen-wrapped book looks absolutely beautiful on display on your bookshelf. Open the book and it will reveal premium components inspired by the original edition stored neatly inside. Ages 8 and up - for 2 to 4 players. 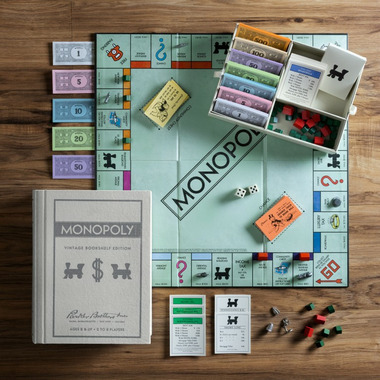 This version of Monopoly is a step back in time to when I was a little girl. The buildings are made of wood and the player pieces are made of metal, just like it was "back in the day." The board looks just like the original as well. The box is attractive and compact, a lovely way to store it on a bookshelf instead of hiding it in a closet. The only complaint I have is the instructions were glued between the book-box cover in one spot and the cover was unglued in another. I also have the Clue and Life versions of these bookshelf games and recommend them wholeheartedly.